Shortly before the Vietnam conflict, an American Airbase in Japan hides a deadly secret, and an even deadlier girl. Who is Saya? What is her connection to the U.S. Airbase? Does she even exist? This title has also spawned a 2009 movie (IMDB movie listing). See the wikipedia entry for more information about ↗The Blood The Last Vampire franchise. Blood: The Last Vampire Style over substance. This has been the case with anime movie adaptations of popular manga series like X (Movie) and Akira who create slick visuals yet lack the time in the movie format to create a solid foundation for plot and character development. Blood: The Last Vampire is no different from these movies. All that is seen throughout this movie is Saya going on a hunt to slaughter demons. There is barely any background given to her character and we get no explanation surrounding the presence of demons that Saya goes after. Not to mention that her character barely has any personality being nothing but a bitter, ruthless girl persuing her targets. The only positive that I can give to this movie is the slick, detailed artwork and fluid battle sequences. There was a great amount of effort put into making the animation to this movie as fluid and smooth as possible. Wish the same effort was given to developing the plot and Saya. From what I hear, there's a TV show adaptation of Blood which is better (as of this review, I haven't seen the show). Go see that and don't waste your time with this movie. Last updated Sunday, March 09 2008. Created Sunday, March 09 2008. Blood: The Last Vampire I did not know much about this film, but it was entertaining. The artwork and animation are impressive. The story is brief and confusing at times, but the plot creates real intrigue and suspense between the vampire and human characters. Last updated Friday, March 26 2004. Created Friday, March 26 2004. Blood: The Last Vampire Personally, i didn't see a point in this anime. Maybe it had nice drawings, because the voices were fake and the storyline sure was crap. If you want good vampire stuff, BUY HELLSING! Blood: The Last Vampire Oh, wow the graphics/anime were breathtaking in this one. I must say, no wonder why the movie was only 45 mins. short. I mean it takes alot of money to make graphics like that. I mean wow, the animation is amazing! I mean in some parts of Blood, I even forgot if I was watching a real live movie or an anime! The graphics, animation, and sound left me stunned. But the story, plot, time, and conversations, were all VERY limited. I mean the plot was, very intresting but the story was, "Hey how did that happen?" And "hey WHY did that happen?" and the most FAQ was "WHAT IS GOING ON?? IAM ABSOLUTELY LOST". But the good part was that most of the questions we had in our minds in the beginning were answered at the end. And a note to "Da kid", the girl is a vampire, if you ever watched the end...that's HOW she killed all those demons. Sorry if that was a spoiler to anyone reading this review. Blood: The Last Vampire Its not that good the animation,art and stuff is ok but.....its just wierd how can a girl that age lift a guy way older than her with ease(i must be missing something) and the whole story needs to be longer she kills a couple uglies and its over ??;[?? i think it really needs to get more in the story and more time. I thought she was a dunpeal(half vampire half human) I was saying how the hell can she lift that guy and why does a small girl have to kill a bunch of uglies, why is she the only one they didnt say s*** like that. I give this a watch because others my age i bet will be clueless as to what is going on.If you want to really watch a good vampire anime BUY!!! VAMPIRE HUNTER D:BLOODLUST if you havent seen it you missing out on a classic. This is the best i have ever seen using cel imagery and CG to bring you ultra realistic movements and lighting. Nothing can be faulted with this animation, there really isnt anything else quite like it. But thats all this anme is good for: the animation. If you were to rip the animation away, then you would have nothing left, no appeal at all. This is due to the fact that there is no storyline whatsoever. Vampires are around, and a girl named Saya is going around killing them with a nicely crafted blade. This sounds like the vampire slaying film Blade already, but if you add in the fact that shes a vampire herself, then the originality of the title is lost. The story wasnt very original, but it had the twist of being set during the Vietnam War, and the characters continually mention Saya to be the last remaining original. I was intrigues by this idea, but they deprived it of a last chance of a good story by ending it just as soon as you thought you were getting somewhere. This story could have been made average, but they decided to end it after 50 minutes of mildly entertaining vampire slaying (courtesy of the well produced animation). No story, great animation. However, I did think that the musical score kept up well with what was going on, capturing the mood of the moment, unfortunately the music didnt get really reach a climax due to it being too short. Last updated Wednesday, August 14 2002. Created Wednesday, August 14 2002. Blood: The Last Vampire I really enjoyed this film. The art & Animation has to be seen to be believed. The Characters come across very strong & The mysterious girl named Saya absolutely captured my Imagenation. Maybe i'm giving it extra credit cuz i like dark & Demented stories. (I read investigative ghost books for goodness sake!) But even if i didn't I'd still give it good remarks. There is just one thing about the film that's very sad & that's that it's just too short. The creators just don't give you enough. it;'s more of an apitizer to a much larger story than a film in it's own. It makes you want to shout out at the end "& THEN WHAT??!!!" You want to know more about Saya & David & Saya's history. You want to know what do they mean by 'The last origanel' It's more like a sneak peek into a very large, Complex & Dark story. But even with this in mind I'd still take it out a secound time to whatch. Last updated Thursday, July 18 2002. Created Thursday, July 18 2002. Blood: The Last Vampire Story line means a lot to me and this one is real short but in the time they have I feel they did a real good job of getting my interest. Such an intrigueing main character makes this a story. she has the personality of a porcipine yet you find yourself routing for her and definatly fearing her. in my opionion very well done charater desine. don't expect an indepth story. I really hadn't read anything about this and went in with no expectations mabye that was for the best. It is probably best described as animes best atempt at a holloween horror flick. the art espcially the lips seemed a little werid to me and very styleized i didnt really care for it but the motion animeation was so well done it not only coutered it, it overcame it. the motion animeation in this is incredible. in my opionion this is a bye. Last updated Monday, December 03 2001. Created Monday, December 03 2001. Blood: The Last Vampire Ohhh neat real good graphics and no story! I cant stand this latest trend towards good graphics is an adequate excuse for lousy story. Blood is worth watching for the mind numbing violence. While it is beautifully animated it lacks depth and story and I found that I really did not care about any of the characters. When the movie was over I was rather upset that it was cut so short because I respected the production company for using the appropriate voice and languages for the characters, but the cut the story so much that there was no story! Blood is worth the price of a rental, but I am sorry if you wasted your money on buying this piece on neo-animation junk. While one of the more visually stunning animes currently available, BLOOD is yet another title that began under interesting pretenses but fell short of expectations at the end. Many will see VAMPIRE HUNTER D in much of BLOOD as the principle character is a lone wolf brandishing a katana with the skill and drive to send the undead back to their graves, but the creators of BLOOD left it all too mysterious to be completely enjoyed. You feel as though youre missing the bigger picture of the tale as nothing is explained about the main character nor her origins and they barely attempt to classify the abominations she slays. In a few words, BLOOD was simply too short for most people and its premature ending is what keeps it from being a timeless anime. Beauty and mystique cant save BLOOD from disappointing many of the people who watch it, but that doesnt mean it should be viewed as its a hell of a ride, even if its brief and confusing. Last updated Monday, November 26 2001. Created Thursday, October 11 2001. 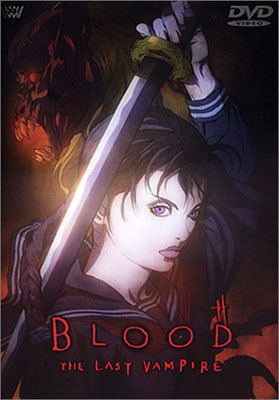 Blood: The Last Vampire Blood is easily the most visually impressive anime I have ever seen. The cutting edge digital animation is nothing short of breath-taking. Character designs are more realistic than usual, with actual lips, noses, and proper bodily proportions. This is definately not CLAMP. The stylish, brooding atmosphere is enhanced by the detailed, familiar backgrounds and the unbelievable musical score. The animation is unbeleivable. Simply put, it's the best I've ever seen. I actually forgot I was watching an animated film as I was transported to a dark world inhabited by vampires and demons. Army "Mutt" Jeeps move convincingly on their suspension, clothes wrinkle when the figure beneath moves, swords glint in the light of a gasoline fire. Nay-sayers of digital animation need to see this film. It has convinced me that if properly done, CG can enhance animation remarkably. Forget crap like Blue Sub 6, this is the future, and it looks bright. If only the story had as much flair as the visuals. As I understand it, there are novels, manga, and web stuff to give us a complete backstory, but until they are translated, it leaves the average fan in the dark. The film stands alone as a decent action movie, but the characters are so convincing, even with their rather 2 dimensional dialogue and cliched personalities that I wanted to know more! And, oh, so much more is hinted at! It's almost like a teaser trailor for the full story. Unfortunately, the animation proved so costly that the creators literally ran out of money halfway through. Clocking in at 45 minutes, Blood leaves veiwers feeling cheated. Blood is a definate rent, if only for the stunning animation and visuals. Last updated Monday, September 16 2002. Created Monday, October 01 2001.